Natasha Crane (left) receiving her Bursary cheque from Northampton Circle President, Keith Webb. 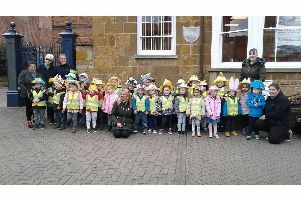 A Harborough student who jetted to Argentina and spent four weeks volunteering at a hospital and at a children’s nursery has been given a grant by a Harborough organisation. Natasha Crane, 17, a student at Leicester Grammar School, visited a meeting of the Harborough Circle of the Catenian Association in September where the group gave her £110 following her visit to South America. Natasha is a member of the Our Lady of Victories Parish and was invited to the group’s dinner. Jim Cooper, from the Catenian Association, said: “Following the dinner Natasha gave an enlightening and polished power point presentation of her visit to Corboda in Central Argentina, where she worked as a volunteer and assisted along with other international volunteers in several hospitals, clinics and nurseries. “Staying with a host family and speaking only Spanish, Natasha highlighted the different culture with three generations living together under one roof and school only either in the mornings or afternoons. Natasha said she plans to study medicine when she goes to university.